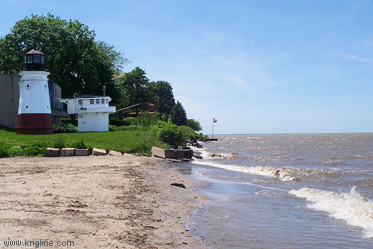 The northern border of Ohio is one of the Great Lakes: Lake Erie. In 2011, Michael and Vivian spent two days visiting America's beautiful "northern coast." 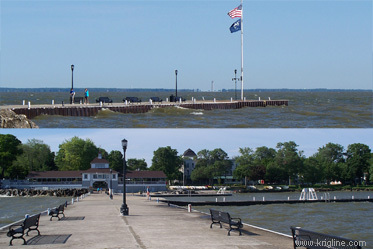 Our destination was Lakeside, a quiet, historic community on Lake Erie, near Sandusky. This montage of photos gives a wide view of the lake from in front of the Lakeside hotel. It was early summer, so the beach was empty, but many canoes are lined up on the far left, waiting the busy summer season. Here is the view from the end of the Lakeside dock, looking back at the pavilion and hotel (to the right). 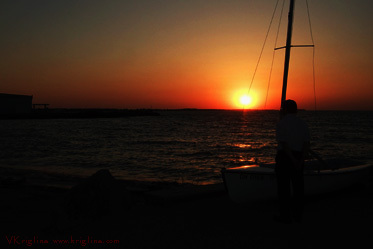 Michael looks out over Lake Erie at sunset, gazing over a small boat at Lakeside's beach. 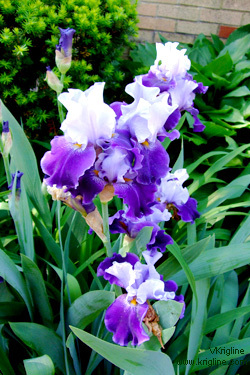 I like the contrasts shown in these photos. 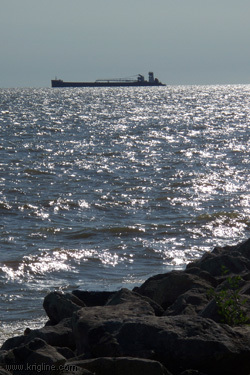 Lakeside has many beautiful flowers, giving the area a delicate look, but Lake Erie is also a major waterway, where large ships carry important cargo to and from all over the world. And the lake can be a dangerous place, for many ships have sunk in terrible weather. The lake is also frozen solid in the winter. 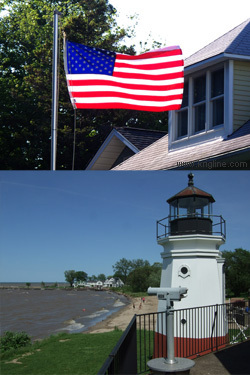 Finally, lighthouses like this Huron Light have long been important to guide ships to safe harbor. A lot of the work previously done by lighthouses is now done electronically (GPS, radio, radar), but we enjoyed seeing the remaining lighthouses on our sightseeing adventure. 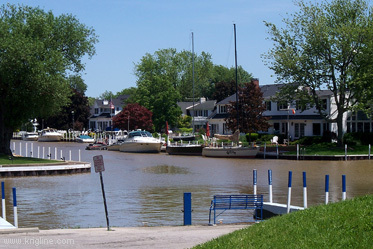 This pretty scene of canal-front homes was in Vermillion, Ohio. I can't imagine the high costs of these homes and yachts, but I know it is more than we will ever have! This photo was taken a short walk from the lighthouse. The Vermillion lighthouse (actually a reconstruction of the 1877 lighthouse) is attached to the Inland Seas Maritime Museum. We enjoyed visiting the museum, but were told that it would soon relocate to another city. 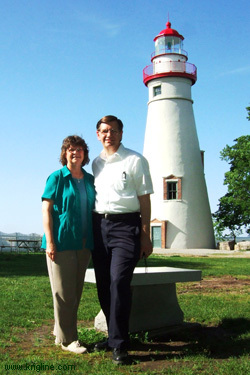 (Left) Vivian and Michael pose in front of the Marblehead lighthouse, which is surrounded by a small park, the lighthouse keeper's house (museum), and a picnic ground (middle photo). 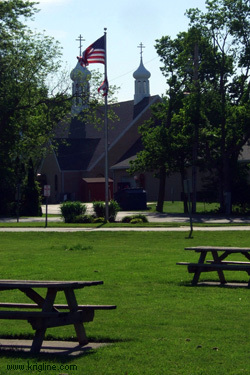 Behind the picnic tables, the onion domes of an Orthodox Christian church remind us of the international heritage of America.  When people moved here from various countries in Europe, they brought different sects or denominations of the Christian faith, such as Greek and Russian Orthodox, Roman Catholic, German Lutheran, and British Methodism. By emphasizing different aspects of their strong faith, their new country developed a culture of mutual respect that was very different from the "fighting" between countries in Europe, often (falsely) in the name of religion. Working together, these immigrants built the foundation for America's international success. (Right) I liked the light on this American flag, flapping in Lakeside's strong winds. 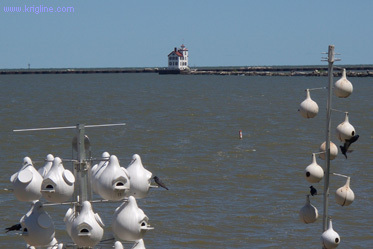 Below this, the Vermillion lighthouse looks out over Lake Erie. To me, the flag was a reminder of the bright promise that has risen from common hopes and dreams that reshaped people from many shores into "Americans." 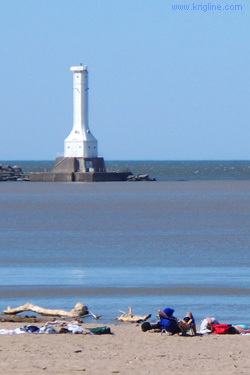 The Lorain lighthouse is rather far from the shore, so it is hard to get a good photo. But this shot turned out nice, looking through busy bird houses on a public beach. 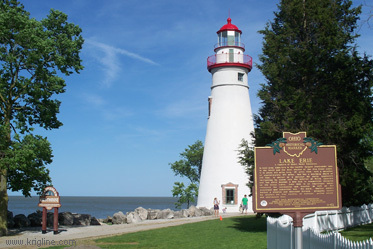 Finally, I'll close with another photo of the Marblehead lighthouse, proudly overlooking beautiful Lake Erie. 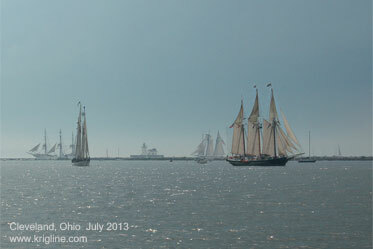 In the summer of 2013, we got to see these Tall Ships in Cleveland. They were sailing from port to port in the Great Lakes in commemoration of the anniversary of the War of 1812.